Timothy Albee is a traditionally trained character animator (drawing on paper) who began working professionally in 3D CGI in 1991. Since then, he has worked on feature films, short films, television series, television and theatrical commercials, and video games using Maya, XSI, 3D Studio Max, Softimage 3D, LightWave 3D, and Traditional pencil-on-paper. High-profile projects on which Timothy has worked include: Battlestar Galactica (2004), Babylon5, and Dinosaur from Walt Disney Pictures. 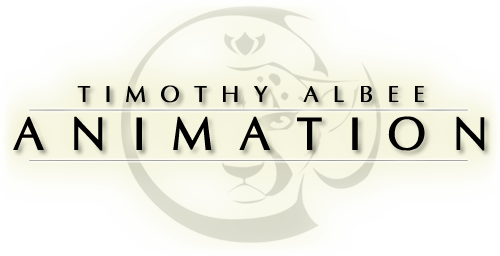 High-profile companies for which Timothy has worked include: Walt Disney Feature Animation, NBC/Universal, Sci Fi Network, and Activision. Timothy has also authored and co-authored 7 best-selling books on 3D character animation, CGI filmmaking, 3D modeling, and 3D character rigging. He has also been a guest speaker at fantasy/animation conventions in Europe and the United States where he has helped to motivate aspiring artists to pursue careers in art and animation. Follow the links above to view current Demo Reel, Résumé (CV), and Credits List. "Timothy Albee is amazingly fast, his output is like that of having four or more people on staff. His innovations, even in rendering techniques, saved the show. Without him, we'd never have been able to meet production schedules." "Tim Albee has effectively taken the visual effects of the Centurions from being eye-candy and turned them into believable character components of the series while improving their look beyond anything seen before on TV of a similar nature."